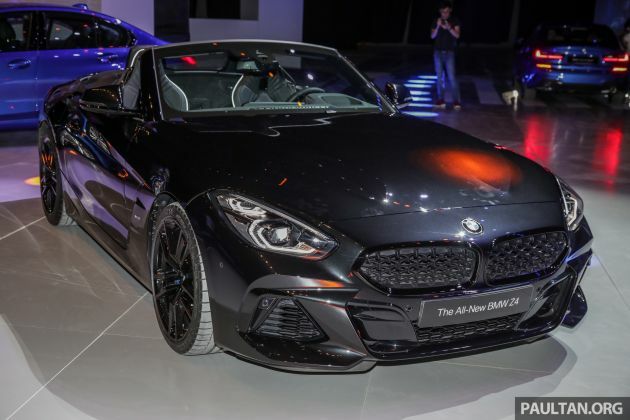 G29 BMW Z4 previewed in Malaysia – RM460k est. The launch of the G20 BMW 3 Series also saw a surprise appearance by the G29 BMW Z4 – the third-generation drop-top is being previewed here ahead of its official introduction in May. The show unit is a M40i variant, as seen in our earlier post on the car from the Bangkok Motor Show. The M Performance model isn’t going to be introduced in Malaysia, however. We’ll be getting the sDrive 30i, and pricing for that one is estimated at RM460,000. Comparatively, it’s priced at 3.999 million baht (RM510,533) in Thailand. The M40i is equipped with a 3.0 litre straight-six petrol motor offering 340 hp and 500 Nm. Performance figures for this one include a 0-100 km/h time of 4.5 seconds and a 250 km/h top speed. Tech novelties include an adaptive M Sport suspension, M Sport brakes, an M Sport locking rear differential and a Launch Control function. The variant also features an M-specific shift characteristic geared to the straight-six engine’s power delivery. The Z4 30i is powered by a 2.0 litre turbocharged four-cylinder engine, with 258 hp and 400 Nm in the way of output. It’ll do the 0-100 km/h sprint in 5.4 seconds, while top speed is electronically capped at 250 km/h. In both models, the partnering transmission is a ZF eight-speed auto ‘box, driving the rear wheels. The post G29 BMW Z4 previewed in Malaysia – RM460k est. appeared first on Paul Tan's Automotive News. 0 Response to "G29 BMW Z4 previewed in Malaysia – RM460k est."